A superb all round performance from Sussex under-15s resulted in Sussex being crowned the winners of the A Division Royal London ECB under-15 Cup Final. Having lost the toss Sussex were invited to field, and Staffs got off to a great start making 54 without loss. 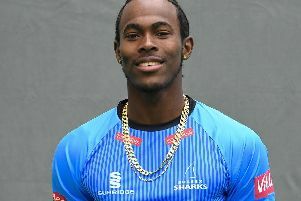 Sussex wicketkeeper Mason Robinson got things moving with a spell-binding flying catch. Skipper Tom Clark then turned their innings upside down with a double wicket maiden on route to figures of 3 for 17, and from that moment Sussex were on top. Max Lincoln wowed the crowds sprinting 30 yards to take a high catch in the deep, and it was left to Tom Gordon (3 for 39) to have Staffs floundering on 164 all out. Alastair Orr completed the job with a well timed catch on the ropes. In reply our openers faced a real barrage of pace and bounce as Staffs were not going to lie down easily. At 68 for 5 Sussex were having their first and only wobble throughout the whole campaign. However our team is resilient and man of the match Tom Gordon lead the recovery with perhaps one of his most important innings thus far, and against a spirited and energised attack Tom grafted hard making a match winning 68 runs. He was backed up by Oliver Carter (39 not out) who demonstrated a very straight bat from the off. He was rewarded by hitting back to back cover drives to win the match. Huge celebrations then ensued as Sussex became the 2016 Royal London ECB U15 Champions.